Phew, the long hot summer is in full swing now. It's been so humid and sticky here in LA that I've had to switch to my summer schedule already, and it's not even the fourth of July yet. That means instead of staying in bed until 10 am while I write my blog—picture me propped up in bed against a pile of plumpy lace-covered pillows like some Victorian authoress, a plumed pen between my delicate little fingers*—I have to abbreviate my morning writing routine so I can get my morning two miles in before the heat of the day zaps my energy and kills any possible incentive to get out there and walk. Once the heat kicks in, I'm done for the day. *That's a lie. I don't own a plumed pen or lacy pillows. But I do write in bed in the morning and my hubs always brings me my first couple of cups of the day. 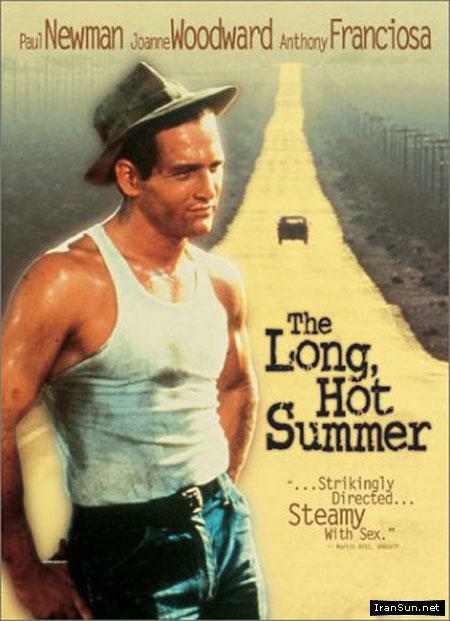 After this week's mini heatwave I can relate to today's #ThrowbackThursday movie, The Long Hot Summer starring Paul Newman and Joanne Woodward. Ennui, listlessness; the weather stirs up languor, like drinking hot milk and honey under a princess and the pea size pile of covers. It's just too damn hot. Languor and lust. When William Faulkner wasn't talking in riddles —Absalom (cough) Absalom—he knew his way around that certain feeling. And director Martin Ritt knew how to capitalize on the crackling chemistry between Newman and Woodward. The couple, who met while making this film, became inseparable. The screenplay for The Long, Hot Summer, written by husband and wife team Irving Ravetch and Harriet Frank, Jr., was based primarily on William Faulkner's 1940 novel The Hamlet. Adapted into a steamy story about a shady drifter being pushed into marriage with the prim daughter of a local businessman, The Long, Hot Summer had all the ingredients for a hit film: colorful characters, striking dialogue and enough heat and innuendo to melt the ice cubes in a tall glass of southern iced tea. Sound familiar? We ran across the iced tea motif in last week's Saturday Matinee, The Bridges of Madison County. Let's watch the trailer for The Long Hot Summer. Need to add a few more cubes to your glass? The Long Hot Summer is available to stream now on Amazon Instant, GooglePlay, Vudu and Youtube.